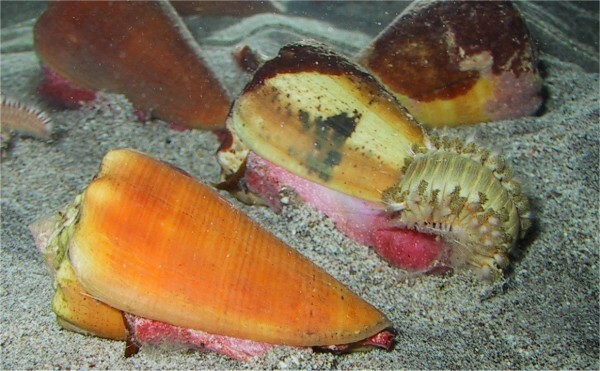 I had the chance to observe many Conus regius Gmelin, 1791 & Conus cedonulli Linnaeus, 1767 in my aquarium and manage to find out what this shells feed on. 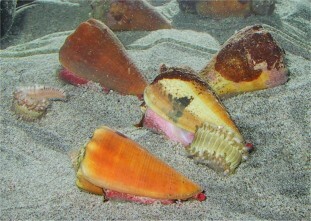 Conus regius and Conus cedonulli (Grenadines Islands) are both worm killers. 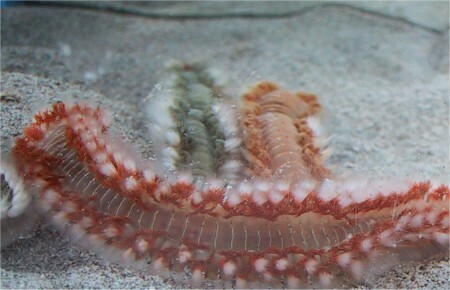 They both feed on the carribean "fire worm" Hermodice carunculata (picture below). 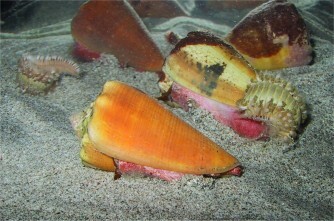 The worms have usually three different colors : gree, orange or red. 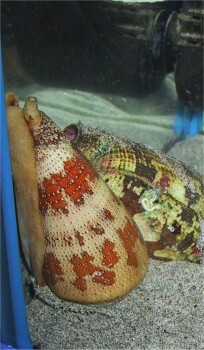 This could partially explain the many variations in color of Conus regius. 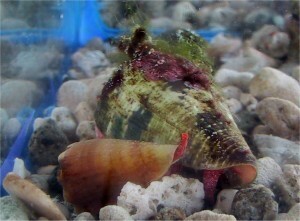 I kept in my small aquarium Conus regius, Conus regius f. citrinus and one specimen of Conus cedonulli I brang back from Union Island down in the Grenadines (read the entire article here). They all have same strategy. They are during day time much less active than during night time but they can hunt, catch and feed during day time. 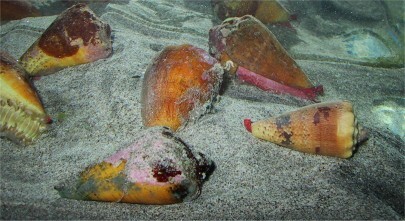 Usually the shells are partially burrowed or just laying in the sand. 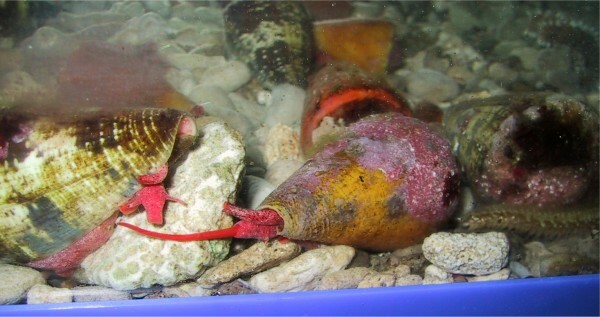 They have their syphon retracted and seems to rest. 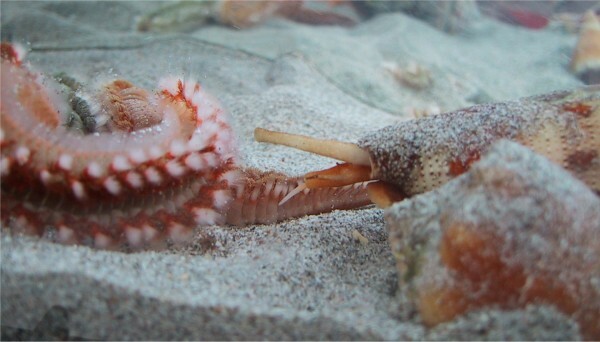 When you introduce the worms, as soon as they enter in the water (by the surface), the syphon of the cone shells start extending and moving around like if it was "smelling", "feeling" the water around it. 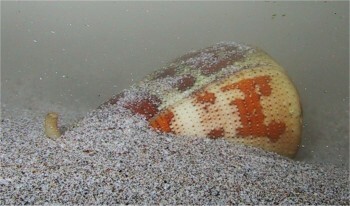 This does not happen when you introduce anything else in the tank. This first comment may clearly show that syhon has sort of chemical receptors that feel very early the presence of a worm in his hunting perimeter. 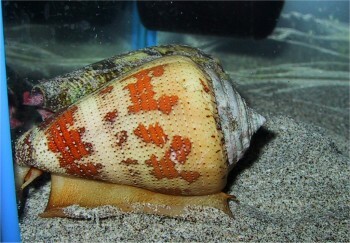 Then the shell start to extend his foot and then you can see the entire animal. But it does not move. The syphon is very active. 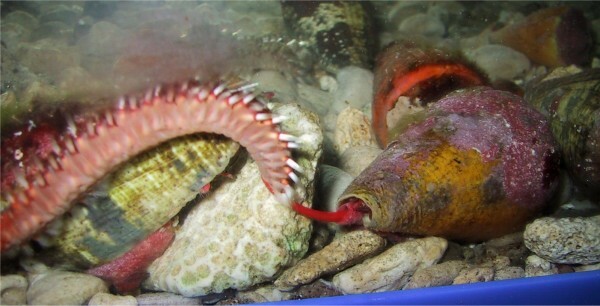 Fire worm is a very active species wich may turn around the aquarium for some minutes before finding a hiding place. 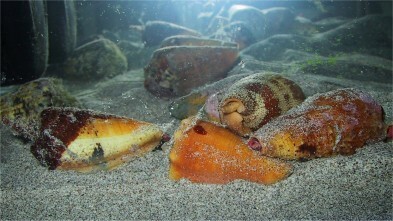 They never care about the shells and passed by or crossed them !! 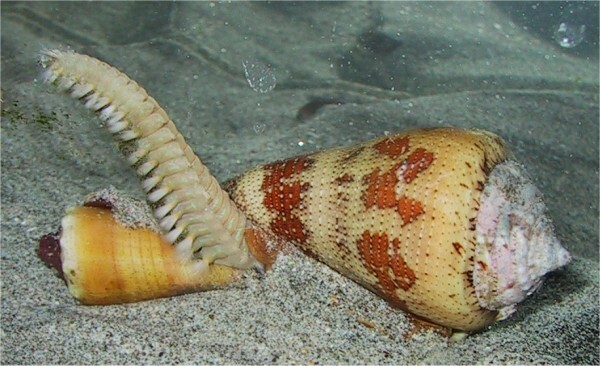 The shells most of the time waited that the worm arrive close to them before extending their spearing appendice. And fastly they hit the worms. It is invisible. 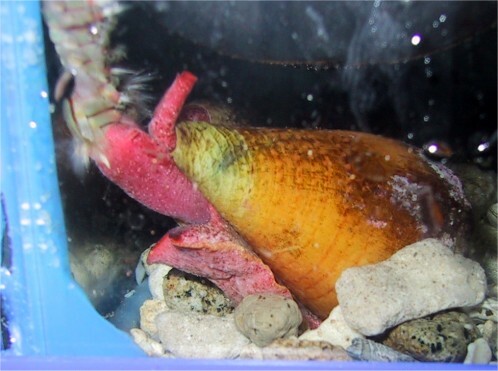 You just see the red spearing appendice close to the worm and then you feel the shot as the worm has a fast movement/ondulation from the part which was shot. The worm usually escape but neevr stops very far though. Sometimes the shell would hit it a second time. let some parts of the worms. 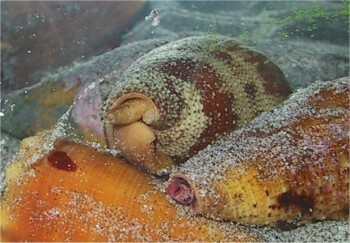 I could observe several shells trying to eat the same worm. But I never noticed a Conus feeding on a dead worm or a part of a dead worm. They really need to feed on live worms.